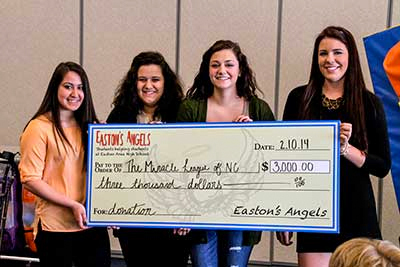 At the Board of Directors meeting on this date Easton’s Angels made a special check presentation to the organization. We thank our special Angels for this very generous donation. On and off the field these are very special ladies who are working to give back to the community through their fund raising efforts. The kids of the MLNC are looking forward to seeing them in the outfield this spring. Pictured from left to right are: Kerena Kemmerer, Sarah Timberman, Alexa Olah and Paige Colver.